Society - Welcome to Our Generation USA! covers our sense of community, whether entertainment, domestic, location, religion, political leanings, race/ethnicity, culture and/or other common traits and interests we share. The society or culture of the United States is a Western culture, and has been developing since long before the United States became a country with its own unique social and cultural characteristics such as dialect, music, arts, social habits, cuisine, folklore, etc. Today the United States of America is an ethnically and racially diverse country as result of large-scale immigration from many different countries throughout its history. The United States has often been thought of as a melting pot, but recent developments tend towards cultural diversity, pluralism and the image of a salad bowl rather than a melting pot. Due to the extent of American culture there are many integrated but unique social subcultures within the United States. The cultural affiliations an individual in the United States may have commonly depend on social class, political orientation and a multitude of demographic characteristics such as religious background, occupation and ethnic group membership. The strongest influences on American culture came from northern European cultures, most prominently from Britain, Ireland, and Germany. Below Chart: On an average day, individuals age 15 and over spent more than half of their leisure time watching TV. 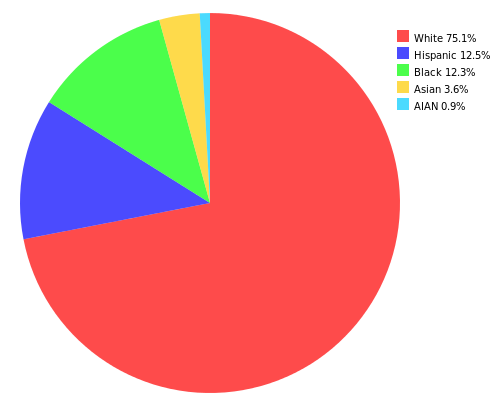 (Data are from the 2014 survey). Below Chart: Individuals age 75 and over spent more of their leisure time watching TV, reading, and relaxing and thinking than individuals ages 15 to 19. The younger age group spent more of its leisure time engaging in sports and exercise and playing games and using the computer for leisure. (Data are from the 2014 survey). On an average day, nearly everyone age 15 and over (96 percent) engaged in some sort of leisure activity such as watching TV, socializing, or exercising. 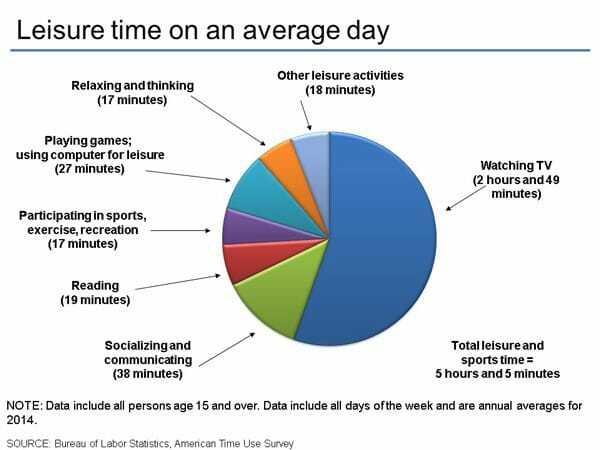 Of those who engaged in leisure activities, men spent more time in these activities (6.0 hours) than did women (5.2 hours). 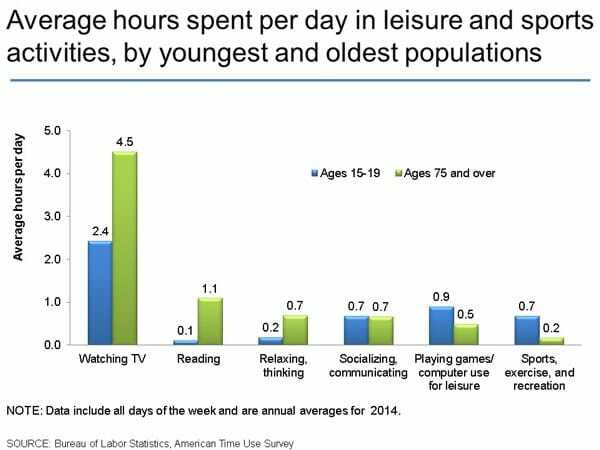 Watching TV was the leisure activity that occupied the most time (2.8 hours per day), accounting for more than half of leisure time, on average, for those age 15 and over. Socializing, such as visiting with friends or attending or hosting social events, was the next most common leisure activity, accounting for 43 minutes per day. Men were more likely than women to participate in sports, exercise, or recreation on a given day—22 percent compared with 17 percent. On days they participated, men also spent more time in these activities than did women—1.8 hours compared with 1.3 hours. On an average day, adults age 75 and over spent 8.0 hours engaged in leisure activities—more than any other age group; 35- to 44-year-olds spent 4.1 hours engaged in leisure and sports activities—less than other age groups. Employed adults living in households with no children under age 18 engaged in leisure activities for 4.6 hours per day, almost an hour more than employed adults living with a child under age 6. Sociology is the scientific study of society, patterns of social relationships, social interaction, and culture of everyday life. It is a social science that uses various methods of empirical investigation and critical analysis to develop a body of knowledge about social order, acceptance, and change or social evolution. 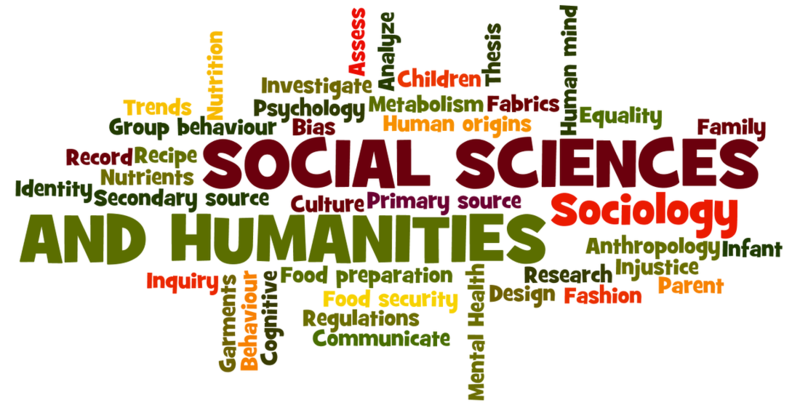 Many sociologists aim to conduct research that may be applied directly to social policy and welfare, while others focus primarily on refining the theoretical understanding of social processes. Subject matter ranges from the micro-sociology level of individual agency and interaction to the macro level of systems and the social structure. and the role of social activity in the development of scientific knowledge. The range of social scientific methods has also expanded. Social researchers draw upon a variety of qualitative and quantitative techniques. The linguistic and cultural turns of the mid-20th century led to increasingly interpretative, hermeneutic, and philosophic approaches towards the analysis of society. Conversely, the end of the 1990s and the beginning of the 2000s have seen the rise of new analytically, mathematically, and computationally rigorous techniques, such as agent-based modelling and social network analysis. and people interested in resolving social issues. There is often a great deal of crossover between social research, market research, and other statistical fields. ​Social class in the United States is a controversial issue, having many competing definitions, models, and even disagreements over its very existence. Many Americans believe that in the country there are just three classes: the American rich; the American middle class; the American poor. More complex models that have been proposed describe as many as a dozen class levels; while still others deny the very existence, in the European sense, of social class in American society. Most definitions of class structure group people according to wealth, income, education, type of occupation, and membership in a specific subculture or social network. Most of the social classes entirely ignore the existence of parallel Black, Hispanic and minorities societies. Sociologists Dennis Gilbert, William Thompson, Joseph Hickey, and James Henslin have proposed class systems with six distinct social classes. a lower middle class composed of semi-professionals with typically some college education, a working class constituted by clerical and blue collar workers whose work is highly routinized, and a lower class divided between the working poor and the unemployed underclass. in addition to many other fields. ​The term is also sometimes used to refer specifically to the field of sociology, the original 'science of society', established in the 19th century. Positivist social scientists use methods resembling those of the natural sciences as tools for understanding society, and so define science in its stricter modern sense. Interpretivist social scientists, by contrast, may use social critique or symbolic interpretation rather than constructing empirically falsifiable theories, and thus treat science in its broader sense. In modern academic practice, researchers are often eclectic, using multiple methodologies (for instance, by combining the quantitative and qualitative techniques). The term social research has also acquired a degree of autonomy as practitioners from various disciplines share in its aims and methods. ​The Great Society was a set of domestic programs in the United States launched by Democratic President Lyndon B. Johnson in 1964–65. The main goal was the elimination of poverty and racial injustice. President Johnson first used the term "Great Society" during a speech at Ohio University, then unveiled the program in greater detail at an appearance at University of Michigan. New major spending programs that addressed education, medical care, urban problems, rural poverty, and transportation were launched during this period. The program and its initiatives were subsequently promoted by him and fellow Democrats in Congress in the 1960s and years following. The Great Society in scope and sweep resembled the New Deal domestic agenda of Franklin D. Roosevelt. Some Great Society proposals were stalled initiatives from John F. Kennedy's New Frontier. Johnson's success depended on his skills of persuasion, coupled with the Democratic landslide in the 1964 election that brought in many new liberals to Congress, making the House of Representatives in 1965 the most liberal House since 1938. Anti-war Democrats complained that spending on the Vietnam War choked off the Great Society. While some of the programs have been eliminated or had their funding reduced, many of them, including Medicare, Medicaid, the Older Americans Act and federal education funding, continue to the present. 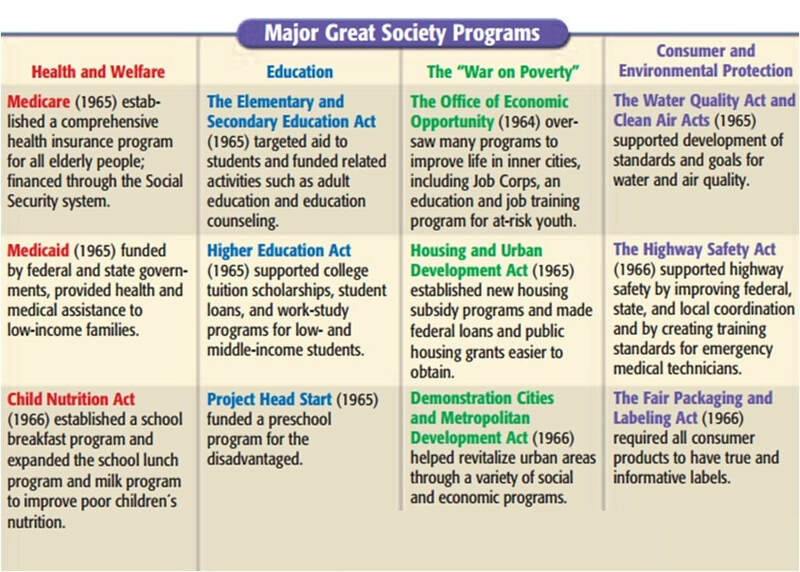 The Great Society's programs expanded under the administrations of Republican Presidents Richard Nixon and Gerald Ford. In 2009, it remained similar to that in some other post-industrial nations with 67.4% of all occupied housing units being occupied by the unit's owner. Home ownership rates vary depending on demographic characteristics of households such as ethnicity, race, type of household as well as location and type of settlement. In 2018, homeownership dropped to a lower rate than it was in 1994, with a rate of 64.2%. Since 1960, the homeownership rate in the United States has remained relatively stable having increased 5.6% since 1960 when 65.2% of American households owned their own home. However, homeowner equity has fallen steadily since World War II and is now less than 50% of the value of homes on average. 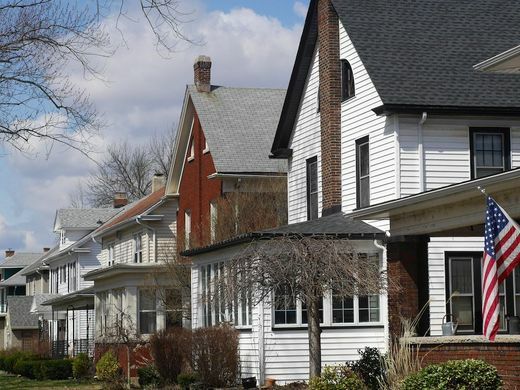 Homeownership was most common in rural areas and suburbs with three quarters of suburban households being homeowners. Among the country's regions the Midwestern states had the highest homeownership rate with the Western states having the lowest. Recent research has examined the decline in homeownership rates among households with "heads" aged 25 to 44 years, which fell substantially between 1980 and 2000 and recovered only partially during the 2001-05 housing boom. This research indicates that a trend toward marrying later and the increase in household earnings risk that occurred after 1980 account for a large share of the decline in young homeownership. The name "homeownership rate" can be misleading. As defined by the US Census Bureau, it is the percentage of homes that are occupied by the owner. It is not the percentage of adults that own their own home. This latter percentage will be significantly lower than the homeownership rate because many households that are owner-occupied contain adult relatives (often young adults, descendents of the owner) who do not own their own home, and because single building multi-bedroom rental units can contain more than one adult, all of whom do not own a home. According to the Financial Post the cost of the average U.S. house in 2016 was US$187,000. Real estate is "property consisting of land and the buildings on it, along with its natural resources such as crops, minerals or water; immovable property of this nature; an interest vested in this (also) an item of real property, (more generally) buildings or housing in general. Also included is the business of real estate; the profession of buying, selling, or renting land, buildings, or housing." Real estate It is a legal term used in jurisdictions whose legal system is derived from English common law in the United States. The size of an apartment or house can be described in square feet or meters. In the United States, this includes the area of "living space", excluding the garage and other non-living spaces. The "square meters" figure of a house in Europe may report the total area of the walls enclosing the home, thus including any attached garage and non-living spaces, which makes it important to inquire what kind of surface area definition has been used. It can be described more roughly by the number of rooms. It is common practice for an intermediary to provide real estate owners with dedicated sales and marketing support in exchange for commission. In North America, this intermediary is referred to as a real estate broker (or realtor). NeighborhoodScout Crime Risk Reports provide an instant, objective assessment of property and violent crime risks and rates for every U.S. address and neighborhood. We offer seamless national coverage and up to 90% accuracy. Discover the lowest crime neighborhoods in any city or town, before you invest, lend, underwrite insurance, send employees to an unknown address, deliver packages, or select a location for your business. We also reveal which types of crime pose the greatest risks in any neighborhood, from theft to homicide. You’ll get the complete crime profile. Our exclusive crime data are developed for each neighborhood using our mathematical algorithms and crime statistics from more than 18,000 local law enforcement agencies. Subscribers get instant access to look up crime risks for any location. Just enter an address or a neighborhood name. Easy access from any computer or mobile device. YouTube Video: Who are Rent Control's Biggest Beneficiaries? An apartment is a self-contained housing unit (a type of residential real estate) that occupies only part of a building, generally on a single level. The term apartment is favored in North America (although in some cities flat is used for a unit which is part of a house containing two or three units, typically one to a floor. Technically multi-story apartments sometimes referred to as mid-rise apartments and even high-rise apartments when there are many stories. Duplex description can be different depending on the part of the country but generally has two to four dwellings with a door for each and usually two front doors close together but separate - referred to as 'duplex' (or 'triplex') indicating the number of units, not the number of floors as they are usually one story at least in the Texas area. 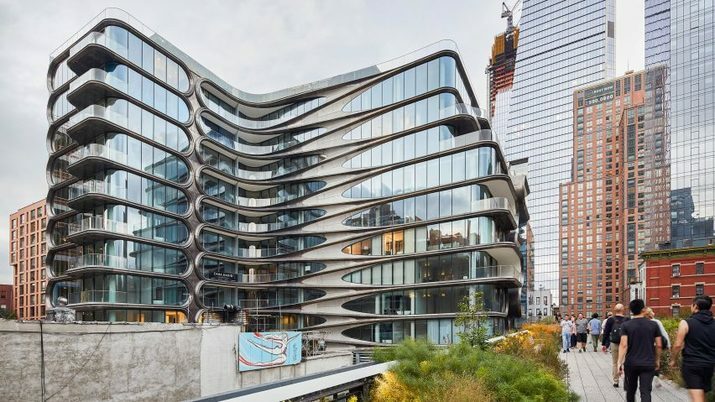 In the United States, some apartment-dwellers own their units, either as co-ops, in which the residents own shares of a corporation that owns the building or development; or in condominiums, whose residents own their apartments and share ownership of the public spaces. Most apartments are in buildings designed for the purpose, but large older houses are sometimes divided into apartments. The word apartment denotes a residential unit or section in a building. In some locations, particularly the United States, the word connotes a rental unit owned by the building owner, and is not typically used for a condominium. In some countries the word "unit" is a more general term referring to both apartments and rental business suites. The word 'unit' is generally used only in the context of a specific building; e.g., "This building has three units" or "I'm going to rent a unit in this building", but not "I'm going to rent a unit somewhere". Some buildings can be characterized as 'mixed use buildings', meaning part of the building is for commercial, business, or office use, usually on the first floor or first couple of floors, and one or more apartments are found in the rest of the building, usually on the upper floors. Rent control in the United States refers to laws or ordinances that set price controls on the renting of American residential housing. They function as a price ceiling. YouTube Video: Is your homeowners association out of control? ​A condominium, often shortened to condo, in the United States and in most Canadian provinces, is a type of living space which is similar to an apartment but which is independently sellable and therefore regarded as real estate. It is where the condominium building structure is divided into several units that are each separately owned, surrounded by common areas that are jointly owned. Unlike apartments, which are leased by their tenants, condominium units are owned outright. Additionally, the owners of the individual units also collectively own the common areas of the property, such as hallways, walkways, laundry rooms, etc. ; as well as common utilities and amenities, such as the HVAC system, elevators, and so on. Many shopping malls are industrial condominiums in which the individual retail and office spaces are owned by the businesses that occupy them while the common areas of the mall are collectively owned by all the business entities that own the individual spaces. The first condominium law passed in the United States was in the Commonwealth of Puerto Rico in 1958. In 1960, the first condominium in the Continental United States was built in Salt Lake City, Utah. Section 234 of the Housing Act of 1961 allowed the Federal Housing Administration to insure mortgages on condominiums, leading to a vast increase in the funds available for condominiums, and to condominium laws in every state by 1969. Many Americans' first widespread awareness of condominium life came not from its largest cities but from South Florida, where developers had imported the condominium concept from Puerto Rico and used it to sell thousands of inexpensive homes to retirees arriving flush with cash from the urban Northern United States. Over the past several decades, the residential condominium industry has been booming in all of the major metropolitan areas such as: Miami, San Francisco, Seattle, Boston, Chicago, Austin, Los Angeles, and New York City. However, in recent years, supply within the condo industry has caught up with demand and sales have slowed. It is now in a slowdown phase. An alternative form of ownership, popular in parts of the United States but found also in other common law jurisdictions, is housing cooperative, also known as "company share" or "co-op". A Housing Cooperative is where the building has an associated legal company and ownership of shares gives the right to a lease for residence of a unit. Another form is ground rent (solarium) in which a single landlord retains ownership of the land (solum) but leases the surface rights (superficies) which renew in perpetuity or over a very long term. This is comparable to a civil-law emphyteusis, except that emphyteusis shifts the duties of up-keep and making improvements onto the renter. In the United States, there are several different styles of condominium complexes. For example, a garden condominium complex consists of low-rise buildings built with landscaped grounds surrounding them. A townhouse condominium complex consists of multi-floor semi-detached homes. In condominium townhouses, the purchaser owns only the interior, while the building itself is owned by a condominium corporation. The corporation is jointly owned by all the owners, and charges them fees for general maintenance and major repairs. Freehold townhouses are exclusively owned, without any condominium aspects. In the United States this type of ownership is called fee simple.